Kyle Middleton & Global Racing Oil Australia are both excited to announce that Kyle will be continuing his partnership with the brand to make it 5 consecutive years in partnership. 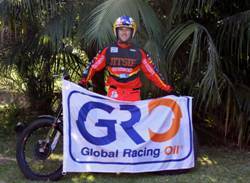 Global Racing Oil Australia has changed hands this year from Solo Motorcycle Imports to a very familiar face in Moto-Trials - Phil Whittle. Kyle has always had a good relationship with the new owner, Phil, so it seems a good move for them both to join forces in a professional manner. Global Racing Oil have been supporting Kyle not only in Australia but all around the world for the past 4 years and Kyle has an annual meeting at the factory near Barcelona to discuss development of the products. The products have been developed and tested in the GasGas by Adam Raga along with other professionals in the field, so there is no question about whether the products are suitable for trials applications. If you would like to know anything about the products or what one is most suitable for you make sure you ask Kyle or Phil. Check out our latest GRO Headlines from our email newsletter. You can read it by downloading the 1MB PDF. The 3 day fairwell to Oran Park Go-Kart race meeting has been run and won to the disapointment of all competitors knowing that its good bye to a great facility. Local GRO sponsored Luke Eberhart finished a crediable 5th in a hard fort battle in clubman heavy. Luke gained enough points without racing all the rounds to finnish 3rd in the club champioship. Lana and Brent stiller, what a family combination! The Global Racing Oils sponsored Norside Motorcycle racing team has again produced some great results in north Queensland’s local motorcycle racing scene. Local fast guy Brent Stiller finished a commendable 3rd on his GRO oiled 250 in the clubman lights, While wife Lana Stiller, who just so happens to be 1st reserve for the Australian women’s 6 day team, won the women’s event out right. Championship winning boat racing team ‘Bollins Racing’ has joined forces with Global Racing Oil to take on the might of the Formula 2 boat racing championships. GRO’S Kyle Middleton home from Europe then adds another state Title! Global Racing Oil sponsored trials rider Kyle Middleton has returned home to Australia after competing in the Spanish and French rounds of the World Trials Championships in Europe. Middleton landed in Spain a few days after crashing out of the Australian titles with the pressure of having to wean himself of crutches before competing in the Spanish round on the Sunday. Prior to the competition Kyle had the extra burden of driving to the GAS GAS factory to pick up his new GAS GAS trials bike before attending his first visit to the Global Racing Oils factory and head office. Global Racing Oil sponsored Brody Nowlan bound for Europe! Firstly we must congratulate GRO sponsored road racer Brody Nowlan for his 2nd place finish in the 2009 MRRDA series. Brody was able to secure 2nd place in the championship without competing at the last round held at Phillip Island. Brody left the 2nd last round 43pts ahead and by finishing upright in the final round he would have surely taken out the championship. Global Racing Oil and GAS GAS beat the world! Global Racing oil and factory sponsored GAS GAS riders Christopher Nambotin and Ludivine Puy beat the best international riders and teams at the 2009 International Six Days Enduro in Portugal this month. The GAS GAS/GRO team riders, world number 2 Nambotin and world number 1 female rider Ludivine Puy were the eventual champions at the International Six Days Enduro (ISDE) held this year in Portugal. It was a great honor for the team to win such an event which is herald as one of the most important Enduro tournaments worldwide. GSY-3 which shall soon be known as ‘Global Smart’ is a high quality 4 stroke Semi Synthetic engine oil. Global Smart is available in 10w40 and 15w50 in 1 liter, 5 liter, 50 liter and 210 lite sizes. Global Smart (GSY-3) is extremely high quality engine oil that is suitable high performance road and off road motorcycles. Global Racing Oil has now found its way into the world of automotive racing in Europe's finest stable Lamborghini! GRO’s GXS full synthetic racing oil is now the choice of the Italian based Lamborghini Racing team. ‘We only us very best possible lubrication with these magnificent racing cars an that’s GRO’. Ten times world champ Raga pushes GRO and GAS GAS to another WIN! Although having had minor knee surgery recently, Adam Raga has been able to put more first place silverware in his cupboard with a win on his GRO GAS GAS at the French round of the World outdoor trials championships. Adam only needed a handful of points to regain his number 1 world ranking but on this occasion he will have to try again in 2010. Final standings in the World Outdoor trials Championships ? 1st Bou (Montesa) 200pts, 2nd Raga (GAS GAS) 188 pts, 3rd Fujinama (Montesa) 147pts. The importer of ITALKART, In2karts at Caringbah, Sydney, continues to campaigned 2 drivers in the latest round of the NSW Pro kart Titles (Night series) held in Wollongong NSW. John Goode placing 4th and other team driver Manual Velasco was placed up the front until some overzealous driving took him out. Team owner John Goode was heading to the complaints department until someone pointed out that sheep stations were on the line. ‘The kart scene is starting to take notice that GRO Kart?2 produces good power and fewer fouled spark plug s, guess that’s why they are trying to crash us out’ stated John. Global Racing Oil and its sponsored rider Kyle Middleton attende the Australian Trials titles held over 2 days at Pacific park, South Maroota in NSW last month. Pacific Park is set down in a tree lined valley with a snaking river surrounding its boundary’s. This ideal motorsport environment was capped off with the sound of V8 supercharged race boats echoing through the valley as they do their best to tame the river. Noel Partridge only knows too well the ability of the GAS GAS EC300 after clocking up over 28,000 k,s. The 62 year old from the Blue mountains in NSW bought his 300 new in 2005 and has in his words ‘given it a canning’ Some might think that the bike would have been babied by a gent of his age but we had word that some riders from one of the dirt bike magazines went with him recently for a tour of some his favourite trails. They ended up doing over 200 k’s of single track in a day and only half finished. What a combination! The Norside Motorcycle sponsored GAS GAS from North Mackay has used its ultra fast pilot Greg Kaddatz and its Global Racing Oil sponsorship to clean up the Grastree beach race in Queensland. The combination has proved itself to be unstoppable at this engine destroying event with line honors for the second year in a row. Global Racing Oil has hosted its first full sponsorship agreement with the Macarthur Motorcycle club and their day/night stadium cross held at the Appin motocross complex in NSW. 224 competitors turned up to compete on the purpose built track with racing starting at 10am and running through till 10pm. The grueling track took its toll on the unwary with the high speed sections and quality jumps catching many riders out. Global Racing Oil was out in force with a quality display of classic and modern machinery, lots of giveaways, free chain lubing in the pits, food and wine for its guests and the ever present GRO girls.